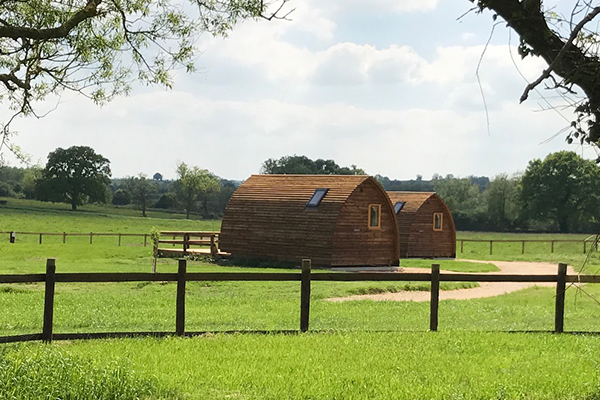 This month we are focussing on the incredible success of the newly opened Evenlode Grounds, a Cotswold farm that now offers luxury glamping in its newly built glamping pods, some complete with wood fired hot tubs. The glamping pods are located in a quiet field just off the main farm, all of which feature hot running water, mini kitchenette facilities and accommodation for up to 4 adults. The glamping site welcomes up to 2 dogs per pod, for an additional surcharge, making it the perfect Cotswold getaway for the whole family. So where does Riley & Thomas Creative come in? We were approached by Evenlode Grounds to create their brand. 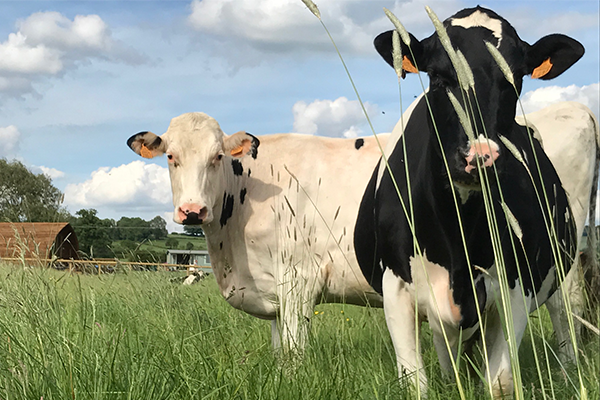 We had several meetings with Amanda and Howard, the proud owners of the farm along with their children and herd of cows. From these meetings we discussed in depth how Evenlode Grounds was to be portrayed to potential visitors as the pods are much more upmarket and include more features than a ‘standard’ glamping pod. 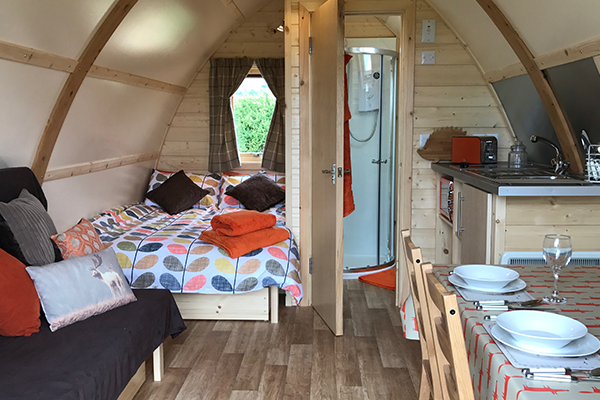 The pods at Evenlode Grounds have been marketed as luxury glamping pods down to their features, location and places to visit within easy driving or walking distance. To start the design process off, in the studio we created a brainstorm sheet. This sheet listed everything we thought about when we thought of glamping, standard camping or farms. This brainstorm gave us strong foundations to build on and gave us a clear direction in which to go. The initial logo designs for Evenlode Grounds involved a lot of imagery such as tents, pods and rabbits. When we ran this past the Woolliams family for the first time, we received some very constructive feedback! We also learnt that rabbits are considered to be a pest on the farm and that having them prominently placed as part of the logo may encourage them – you never know. After a rainy visit to the glamping construction site back in April, we had a further brainstorming session and caught up with the Woolliams family. Within this session we whittled down the many ideas we had shared including proposed icons, fonts and colour schemes. From this meeting, we had a much clearer vision of where the brand was going. We also had a fantastic selection of images of the farm and the pods from the Woolliams family which now happily reside on the Evenlode Grounds website. Back in the studio we played around with further ideas, adding a hare to the logo which then transformed the logo and the brand greatly. The brown hare especially, is known as being Britain’s fastest land mammal, in addition hares are often seen as a symbol of life, balance and creativity. They are also very shy creatures and are rarely seen for most of the year, unlike rabbits who are difficult to shake off! However, the most interesting fact about hares is how independent they are almost immediately after birth, this paved the way for showing how strong and independent, creative and balanced Evenlode Grounds is as a luxury glamping getaway for families, romantic retreats or groups. Throughout designing the logo, and while in the process of designing the website, we went through a number of different colour schemes in the studio. The final colour palette chosen is a calming mix of pea green, earthy brown and a light natural taupe. This colour palette was chosen to reflect the outdoor tones synonymous with camping and adventure. The font however was chosen almost immediately. Loved and fully approved by the Woolliams family, we went with the slightly wonkier font style. This primarily reflects the rustic and ‘perfectly imperfect’ style of getaway the holidaymaker is about to embark on. Amanda didn’t like the idea of things looking ‘too perfect’ from the very start of the design process, meaning the initial designs of pairs of animals were stripped back and further amends included having the logo slightly off centre. We then applied all of what we had discussed with Amanda and her family to the website design, adding in a rustic wooden background to compliment the outdoor tones used with the logo and throughout the site. 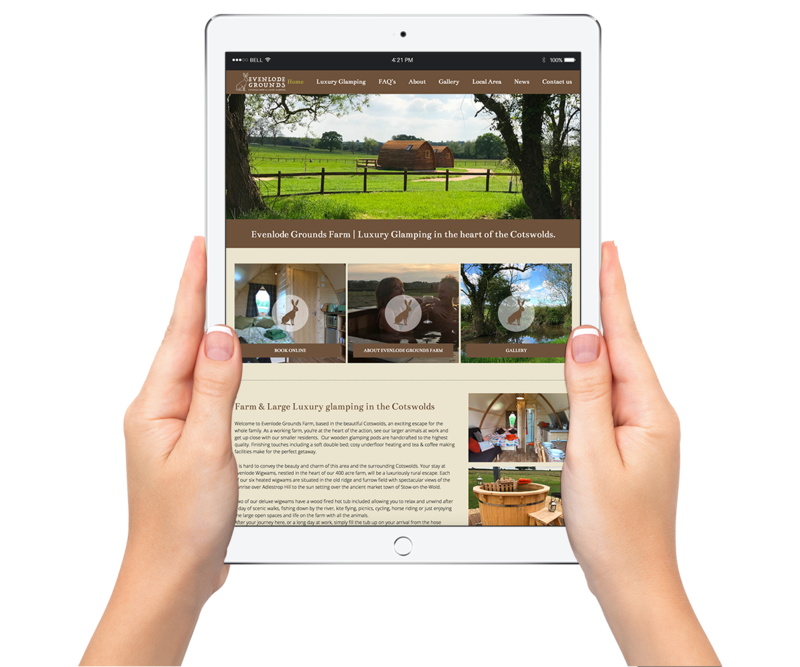 The creation of the website was wonderfully straightforward as we had worked so closely with Amanda and understood the vision she had for Evenlode Grounds. We then went through numerous rounds of tweaking the website with Amanda in order to make sure the site was perfectly designed. The hare imagery is subtly continued throughout the site and adds a consistency to the brand. Throughout the site we focussed on the strong imagery provided by Amanda. Namely the pods as seen through the trees, wildlife found on the farm and the resident cows – one of whom we learnt is called Trudy and is very friendly! Going for a more image heavy based approach has really helped to bring the site to life and give potential visitors a real feel for the peace and tranquility found at Evenlode Grounds. Creating such a strong brand has been a joy for us here at the Riley & Thomas studio, even more so as the Woolliams family were thrilled with the final result and receive alot of compliments on their very smart looking website! Since the glamping site launched in May, Evenlode Grounds has gone from strength to strength in a very short space of time. All of their luxury glamping pods have been fully booked out every weekend until mid January 2018 and they are expecting the arrival of a third wood fired hot tub very soon, due to the huge popularity of the existing 2 hot tubs on site. Their expected profit is to be very high within the first year of business, with the potential to double this with their continued popularity and strong marketing and design work. If you have a new business you are about to launch, or own a business whos branding has seen better days, Riley & Thomas Creative are happy to help. Whether it’s getting your branding off to the same flying start as Evenlode Grounds or giving your current branding a makeover, we love discussing new projects over a cup of freshly ground coffee and a wedge of cake. Call us on 01386 842936 to see what we can do for your branding.